Like many others, I have been inspired and enchanted by Mo Thomson’s beautiful videos of the Outer Hebrides. When I first watched ‘A Sun-Kissed Weekend’ I was completely and utterly absorbed, as if I had been pulled right into the scenery – standing on the dunes with the wind-blown grass, ankle-deep in the sea as waves rolled onto the shore, watching the sun sink into the hills… He captures the beauty and tranquility of the island in such a way that it reaches out to me; showing me the poetry in the lines on the sand, the rivers of clouds, the stretch of empty beach. It is the work of someone who truly loves this island, and his videos are the love letters. We invited Mo to share his experiences of Lewis and Harris, and tell us the story of how and when the island took hold of his heart. What were your first impressions of Lewis and Harris? I first arrived on Harris after getting the ferry over to Leverburgh from Berneray in North Uist. I was driving down the hill just before Northon and when I looked at the horizon, it was a golden sand colour. I thought I needed my eyes tested, as surely it couldn’t be sand, but as I drove further north, it was indeed miles of golden sand around the Northon and Scarasta area. It’s the large area of sand at the end of my most recent video. My first time on Lewis was when I was there filming a holiday home video. After a day of filming, we headed to the standing stones at Calanish and then headed up to the broch at Carlaway to get some time-lapse images. Donald said that it would be fine leaving the camera running unattended whilst we went to the local hotel for a fish and chips and a pint. Being a city dweller, I was a bit wary of leaving it but when we got back the camera was still there. Your videos of Lewis and Harris are just magical – how long did it take to make your recent winter trip video? The video was footage from two different weeks in February and March 2014. At that time of year, I wasn’t expecting to be in the waves in my waders and climbing 1200 feet hills in February, but I was (and a very happy chap!). 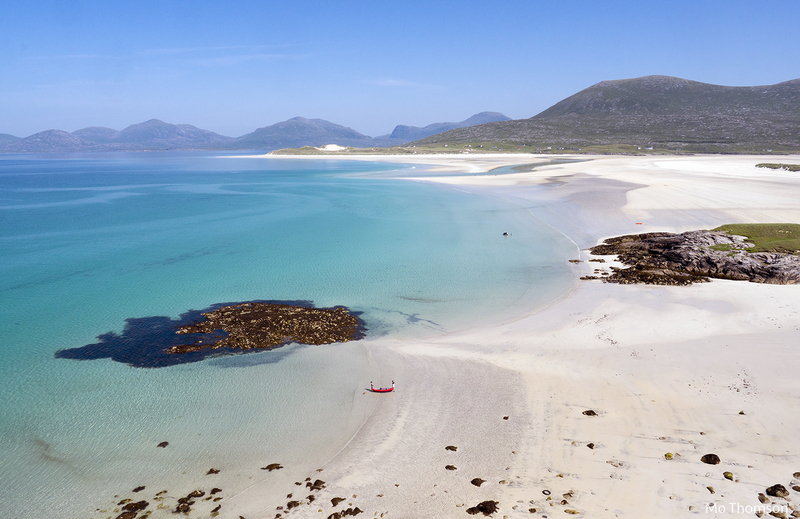 Which is your favourite beach in the Outer Hebrides? On Harris, I do love Luskentyre, but my favourite beach is at Seilebost. It overlooks the long white sands and turquoise blue waters towards Taransay, with Luskentyre just off to the right hand side. On Lewis, I was recently introduced to Riof beach and I am looking forward to going back there in the summer, but I want to get to Tolsta beach too sometime. The beaches on Harris are closer together and visible from the main road; the Lewis beaches are more off the beaten track and wider apart, but equally as good. What’s your favourite season to visit? That’s a tricky question, because I enjoy going all year round in all sorts of weather conditions. 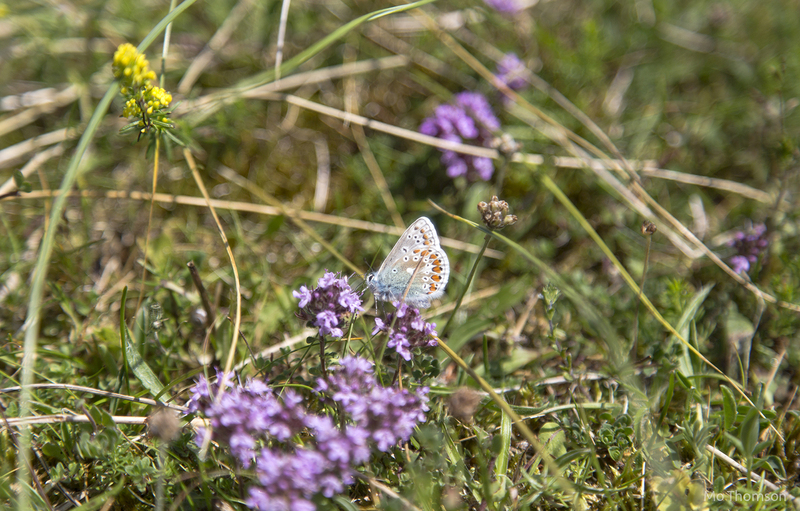 I would have to say late spring/early summer though, due to the warmer longer days and it’s when the machair comes alive with colour. If the weather is good, there is no place in the world I would rather be. The downside with summer is that it’s harder to get somewhere to stay and the ferries can be hard to book some Saturdays. I love going out of season as there are more vacancies, lower prices and more deserted beaches all to myself. Outwith summer, Lewis is especially suited for night time dark skies and there is a chance of seeing the northern lights, as it is so far north and has more uninterrupted views north. What has been your best discovery on Lewis or Harris? On Lewis, Segway Hebrides at Stornoway – I really recommend giving them a try for an hour of fun. On Harris, Croft 36 at Northton for superb local fresh food and home baked bread. Landscape wise, I recently found a sand blasted beach at Ardoil on Lewis. 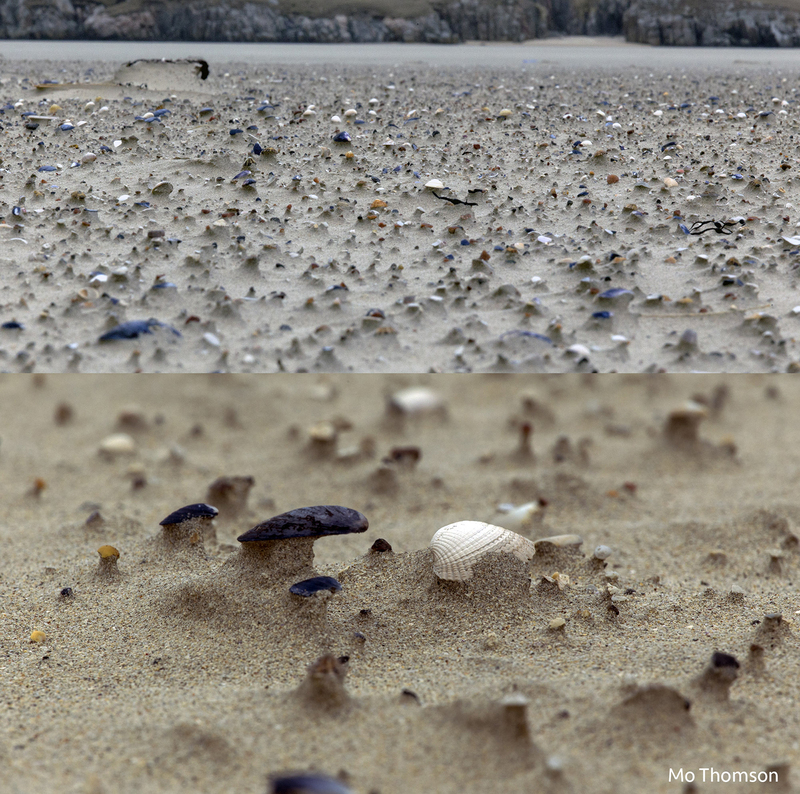 Thousands and thousands of shells were sitting on top of wind blasted mounds of sand, like little wind sculptures. It was quite surreal, but beautiful to see the wind making little pieces of art. Where is your favourite place to watch the sun set? It depends on the time of year, but during the summer months you get a nice sunset around the Borve/Scarasta area and also from the pier at Leverburgh. I love spring and autumn sunsets around Luskentyre, but the sun goes behind Taransay in the summer. I reckon Great Bernera on Lewis will be a great place to view a summer sunset too, I will be checking that out this year. Which moments in the Outer Hebrides have stayed with you? 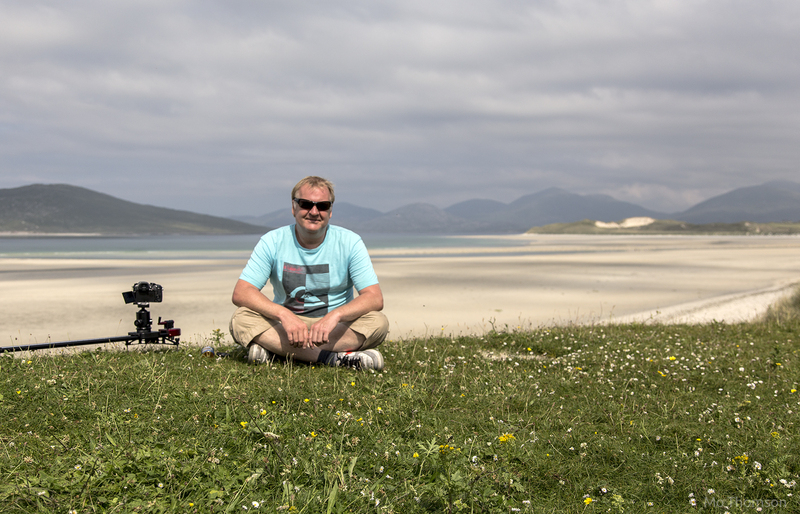 During November 2012, I was staying near Seilebost whilst filming a holiday home video. It was only a week after my mum’s funeral. I found the tranquillity of the Hebrides very healing as I sat by the log fire with a few glasses of malt whisky on a cold Tuesday night. 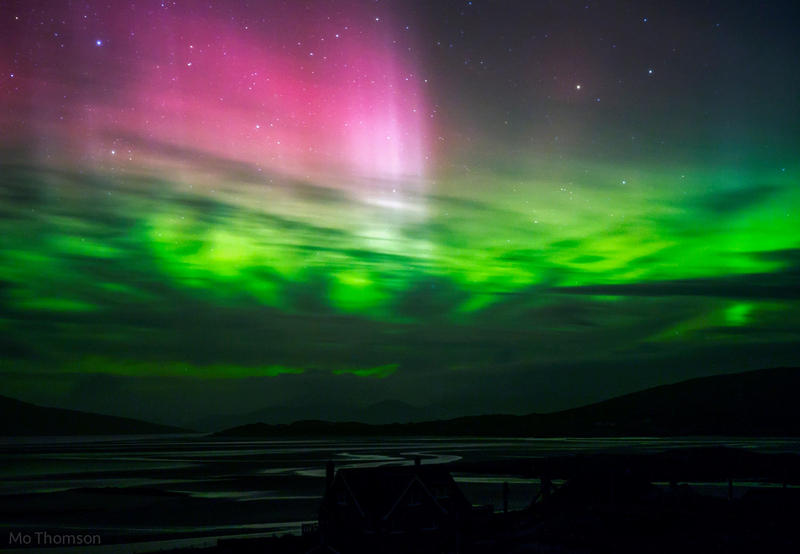 I popped outside onto the balcony and I noticed a green glow above the north Harris hills. I was puzzled at first, as it looked like the glow of city lights, but I knew there were no city lights around. My eyes eventually adjusted to the dark, as turquoise shafts of light started moving slowly across the sky above the mostly green horizon. It was quite cloudy, but it was my first introduction to the northern lights and they lasted for two nights. I got the camera out and got a few photos, from that point I was hooked. I will never ever forget those two amazing nights at the saddest time. One of the reasons Seilebost is my favourite beach is due to a couple of hours I spent there just before midnight at the summer solstice in 2012. 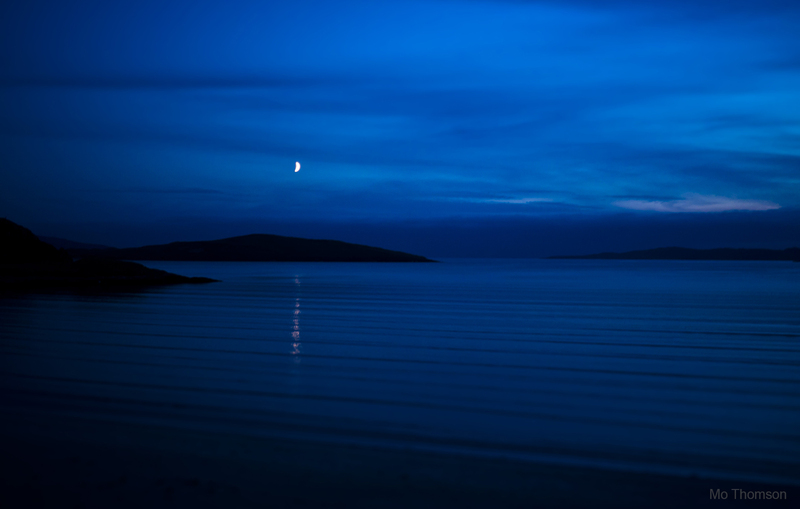 A partial moon was setting an hour after the sun had gone down behind Taransay. As well as being a visual treat, there were some unusual bird noises that I had never heard before. The stereo sound of waves rolling in from left to right was blissful. I welled up as my senses were overloaded with how beautiful it both looked and sounded. It was an amazing midsummer’s night. Do you have any tips for visitors looking to get off the beaten track? I have still to explore Lewis more, but I recommend going to the Uig area and also taking a trip to Great Bernera. On Harris, I recommend exploring Scarasta beach, which involves a 10 minute walk to get there. If you are fit enough, take a walk up Ceapabhal (pronounced Chaipaval) for an amazing view from 1200 feet up. If it’s not too cloudy you can see St Kilda about 40 miles away. What wildlife have you seen during your visits? Golden eagles, sea eagles, buzzards, seals, gannets, fulmars, whooper swans, geese, lapwings, ducks and cormorants. I love watching the gannets diving straight into the sea to catch small fish. I would love to see an otter up there, but I wouldn’t want to disturb any – it would be wonderful to catch a glimpse of otters along the water’s edge one day. The machair is so colourful and pretty and it always amazes me how the maram grass grows out of the white sand. There are colourful snails and butterflies around the maram grass in the summer, so be careful when walking around the dunes. Other animal life you will encounter is lots of sheep, and you may see ponies or highland coos. And if a Border collie comes over to you and drops a stone at your feet, be prepared for a wee game of fetch and to make a new friend. What other hidden gems have you discovered during your travels around Scotland? I haven’t been to the Knoydart peninsula yet, but I would love to go to there. We asked people to submit their images of ‘the real Scotland’ in our recent photo competition – what does ‘the real Scotland’ mean to you? Definitely not the tartan shortbread tourist image. I love the big scenery, big skies, snow-topped mountains, remote beaches, dramatic ever-changing weather, the people, the wildlife, the food and all the fresh air! As well as tourism and promotional videos, Mo’s creative digital media services include videos for holiday homes and photography. Mo is planning a photography workshop in the Outer Hebrides in either May or September – if you would like more information you can contact Mo via his website mothomson.com. You can also find Mo on Facebook and on Twitter @MoThomson. All images courtesy of Mo Thomson ©. For more of Mo’s beautiful island images take a look at these photos of Lewis and Harris.